Jasmine Akins was killed early Sunday in a shooting her Market Street. The Chocolate City club is located at 27 W. 19th St.
Jasmine Akins didn't go out much, her family says. She wasn't a big partier. But she did go out on Saturday night. She wanted to celebrate her friend's birthday, and the party was the first time she'd really gone out with friends since her daughter was born in June. The 19-year-old stayed out late, into the early hours of Sunday. And then she died, shot dead in a parking lot on Market Street. "No one thinks someone is going to take their life just because they go out and have a good time," said Brittany Crutcher, Akins' cousin. "It's unbelievable." Akins was killed in a shooting that wounded two other people around 2:30 a.m. Sunday in a parking lot at 1900 Market St. Neighbors said the gunfire sounded like a battle between shooters, with two weapons firing back and forth and as many as 15 shots ringing out. Now, as Akins' family plans a candlelight vigil in her memory, Chattanooga police are investigating what happened Sunday and making plans to prevent future violence, said Lt. Tammy Cook. Police say the area where Akins died was a hot spot for partying teens. "They just hang out in the business parking lots on Market Street and have their own parties outside," Cook said. "And so that becomes a problem." The street parties happen close to a club called Chocolate City, which is nestled just off Market Street on West 19th Street. The club is open only to people age 21 and older, Cook said, but teens often will congregate outside in the parking lots. The club itself doesn't have a bad reputation. Until lately, it catered to an older crowd, according to police. "From talking to other officers, it has been a really low-key club," Cook said. "There was a change this year in which they started holding events that a younger crowd was starting to come to. That's when we started to see some trouble." She said police have not yet determined whether Akins visited the club or merely hung out in the parking lots outside. The club's owner, Thomas Sexton, did not respond to requests for comment Wednesday, but Cook said he's been working closely with police and may raise the minimum entrance age to the club from 21 to 25. This week, police are asking nearby business owners for permission to clear all loiterers on the lots after business hours, Cook added. "We're hopeful that this will be a much quieter weekend," she said. But the shooting so close to downtown still rattled nerves throughout the Southside. 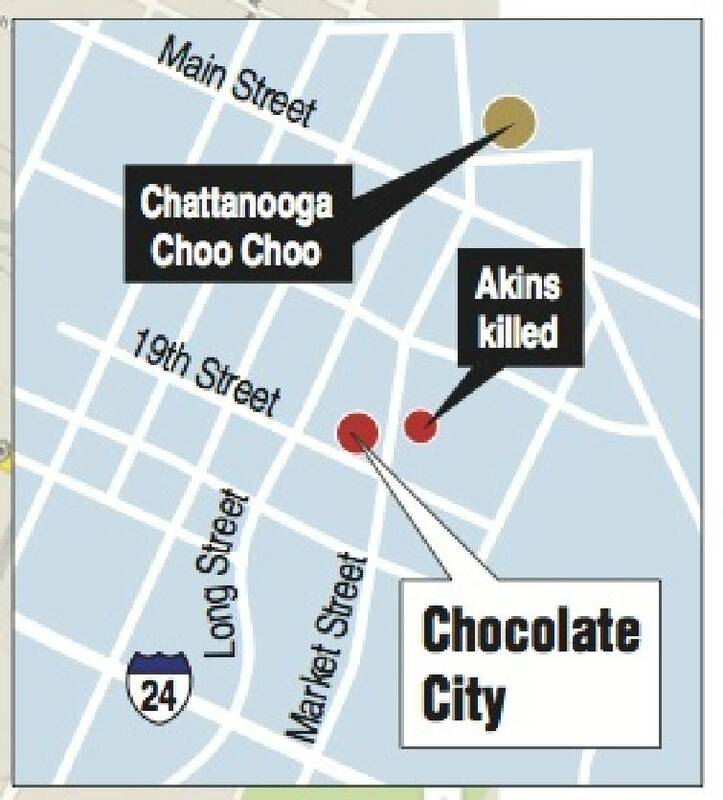 The incident happened a half-mile from the Chattanooga Choo Choo, a historic landmark that is slated to receive an $8 million upgrade next year. Part-owner and former Chattanooga mayor Jon Kinsey plans to bring in two new restaurants, relocate a comedy show and build a 500-person music venue on Choo Choo property. And in August, the City Council created a new downtown music district that will allow businesses with a permit to crank their volume up to nearly twice the previous sound limit. Kerrick Johnson, president of the Fort Negley Neighborhood Association on the Southside, said he's afraid the city's new music district could spark trouble similar to Sunday's shooting. "I'm not saying that having an entertainment district means everyone is going to get shot all the time," he said. "But in entertainment districts, there are more pedestrian fatalities, DUI-related accidents -- a lot of things follow these districts." Meanwhile, Akins' family members are trying to make sense of Sunday's violence. They remember Akins as an outgoing person who enjoyed music and dance and loved her infant daughter. "All she did was smile," said Brandi Nollie, her aunt. "Every time you see her. Everybody knew her by her smile."